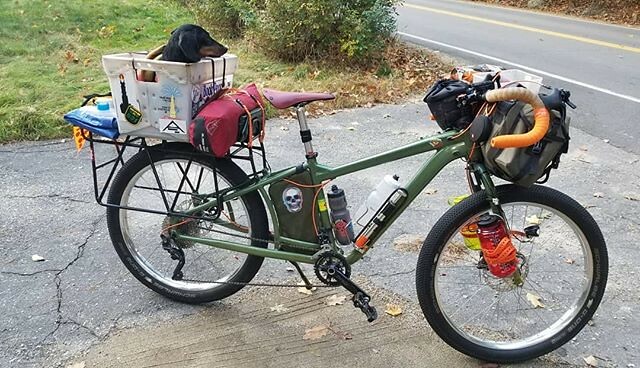 K asked me recently whether I’d posted anything about the thinking that led me to plan a serious long duration bike tour and I had to confess that I hadn’t. I’ll remedy that with a bit of the history of the idea and some of the things I hope to do on the ride. Airstream. Pros: comfy! Cons: price (esp when the tow vehicle is factored in), lack of maneuverability. Van conversion. Similar to the Airstream, but less comfy and more maneuverable. Bicycle. Pros: cheap! Low/no carbon! Cons: much smaller load capacity. The bike option won. I love bike touring – I think it is one of the very best ways to actually experience the country one moves through. It can be stealthy, low impact and inexpensive. And a well set up bike can handle a huge range of terrain: pavement to singletrack. My body was also a consideration; apparently I am not getting any younger and if I do want to take a big ride, sooner is favored over later. So a-riding we shall go! The thing I most want to do on the trip is simply to experience the landscape: rocks, rivers, trees, birds, lizards, people, bridges, stars in the night sky and everything else I can wrap my senses around. And I want to learn! I want to pick my high school Spanish back up and get way better at it. I want to write more, and more betterer. 😉 I want to learn the names of unfamiliar things, I want to improve my photography and film making chops: I’m bringing a camera with macro and tele lenses for wildlife stuff and a couple GoPro Sessions for on the bike vids and kite aerial photography. I’m going to go fishing – and swimming! And I’m going to ride where I want at any pace I feel like. The riding itself is also part of the point. I find it to be meditative and a good way to sort things out in my head. I’m hoping to spend significant time in the moment – Flow for Dummies – and I want to think about post-ride activities – how I can help my loved ones survive The Jackpot. We’re now a couple weeks from departure (I hope). Soon, this space will become a travelogue blog!